What a fab deal! 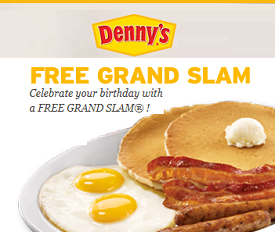 Get a Denny’s Coupon for a Free Grand Slam meal! It’s easy to get this freebie from Denny’s. Head over to the Dennys Specials page and join in their “rewards program” they will send you a coupon for a Free Grand Slam meal on your birthday! I love Free On Your Birthday Deals. Don’t forget to have the whole family join too, let everyone get a free on your birthday deal! Sign-up for the loyalty rewards program. On your birthday get a free Grand Slam breakfast when you show your ID card with your birthday. Enjoy!